Today we pay tribute to Beatle John Lennon, who was on this day in 1980 shot to death outside his New York City apartment building. 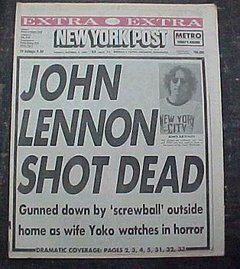 It is not the role of this On This Deity entry to heap upon Lennon’s tragically early demise even more tributes or slag-offs, but rather to note that – had Lennon been shot ten years earlier – the heading of this particular entry would have been more suitably titled “The Assassination of John Lennon”. Bed-ins, free festivals, protest singles, direct actions – you name it, the Lennons had between 1968 and 1973 represented it. That Lennon had in those immediate years prior to his death returned to “Civvy Street”, however, undoubtedly made him a suitable target for pissed-off radicals, right-wing lunatics or any number of former members of the counterculture who could have had it in for either of the Lennons and the Me Generation manner in which they bailed out of the revolution. In truth, however, Lennon’s killer was none of the above. Instead, he was no more than a Herostratus, here to burn down the temple, baste himself in its raging fires, re-baptised by the tears of the distraught followers. And perhaps that’s the final ignominy: that John Lennon’s life – having become politically meaningless – rendered him the victim not of the assassin’s enraged need for revenge, but to assuage a feeling of nothingness in a wholly nothing person – the entire amorphous and spineless mass that is No-Mark Chapman. This entry was posted in Heroes. Bookmark the permalink. MDC had wandered up to Bearsville Studio in the period before the assassination; he was there looking for Todd Rundgren (who had an early version of Utopia Video in one of the buildings) and he drove the blue van that was there, and he asked for a job… I’m sure they treated him well, however he never was given access to TR of course (fortunately). This was related to me by people who worked there at the time; I worked there a few years later. Stephen King also tells a tale of an encounter with someone he was “pretty sure” was MDC in a parking lot… Of course this _is_ Stephen King.